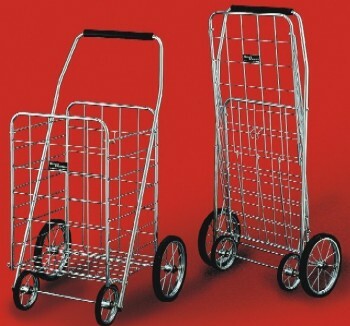 Are you looking for something a little bit different in your folding shopping cart? The Jumbo Chrome Elite is it!!! A very snazzy looking cart with great functionality and built to last. The chrome plating and solid rubber wheels on this cart will add years of longevity and tough use to this cart. The Jumbo Chrome Elite is a four wheel, folding shopping cart that will hold loads up to 150 pounds in weight. 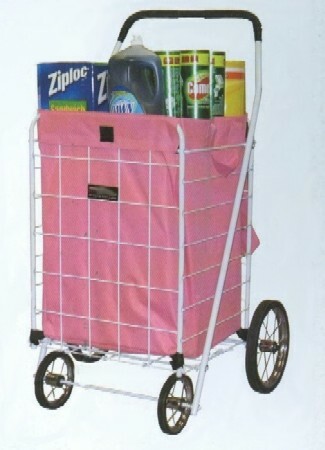 This cart will be great for shopping, laundry or any other utilitarian use. The cart has a comfortable, thick foam grip, four solid rubber tires and chrome plated steel spokes and a large, roomy basket big enough to hold everything. The cart stands 40.75 inches tall from floor to handle. The basket is 14.5 inches deep, 17.5 inches wide and 24 inches tall. The rear wheels are 10 inches in diameter and the front are 6 inches. 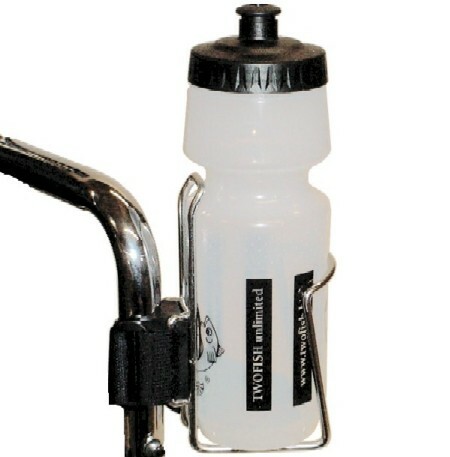 Click on "more pictures" above to view measurement image. 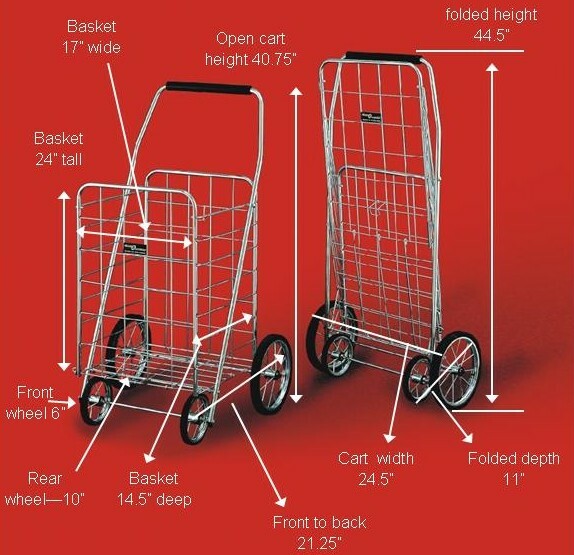 The cart can be folded flat when not in use; the cart itself will flatten to about 4 inches in depth with the exception of the wheels (11"). The weight of the cart is right around 14 pounds. This cart, however, ships at an oversize dimension weight of 33 pounds due to the size of its shipping carton. 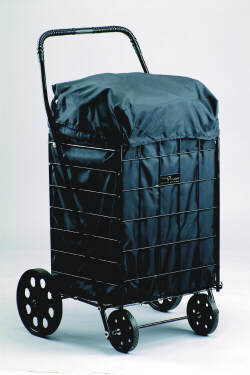 Optional cart liners are available for the Jumbo Chrome Elite Cart. This cart is eligible for expedited shipping (although it is expensive) and international shipping. Safety Notes: This cart may not be suitable for the frail, infirm or elderly as it may be too heavy. This cart cannot and should not be used as or substituted for a walker. Click on "more pictures" button to see the cart measurements.